I was trying to work out why the bus I was waiting on didn’t come down to the stop but turned off up the wrong street. 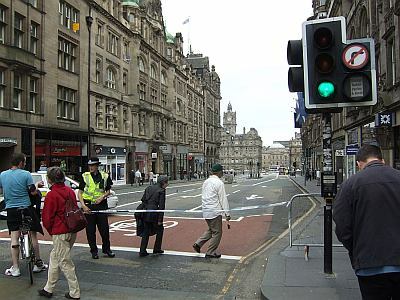 Then I think, hold on, it is rush hour and there are no buses, no-one else waiting at the stop – oh, what’s the commotion just over the junction of the Royal Mile? Walk up a bit and find the approach to North Bridge is sealed off by the police, ambulance and fire engines sitting there too. Hmmm, surely it must be a fire or bomb scare? Can’t be another potential leaper, surely? We’ve already had one of those this week, shut down the area for hours. Take another route down to Princes Street and everywhere is a logjam of buses and cars, everything totally fubared. 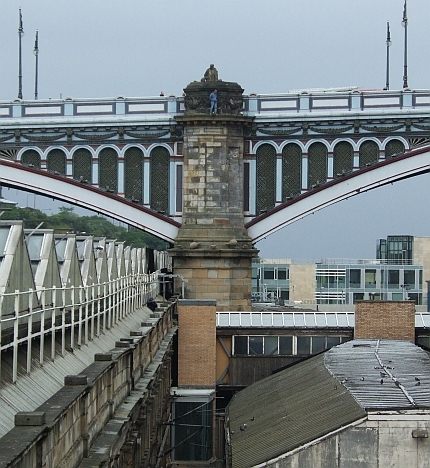 I look up and yup, it is indeed another person threatening to jump from North Bridge – sadly not an unknown act from that spot. Luckily as with the woman earlier this week he didn’t actually go through with it, although he was there for hours and really messed up the city’s traffic. 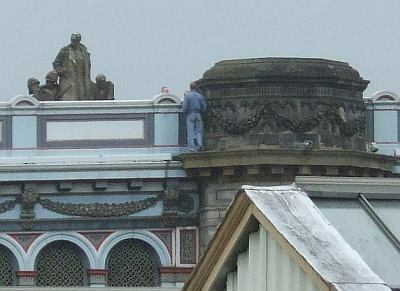 Since he was walking round the pillar with his hands in his pockets it looks like he was really doing a cry for help and attention (you can see a policeman’s head just over the parapet trying to talk him down) – caused a lot of hassle but you have to feel sorry for the poor sod if he felt he had to go to this extreme. Now there are folks calling for safety nets to be placed under the bridge because it has been used a number of times for suicides (there’s a Samaritans sign on the bridge because of this) which seems pretty pointless to me (as well as ruining a landmark) since the city is built on several hills with plenty of tall spots. Heck, if someone wanted to leap they could go up Arthur’s Seat and jump off Salisbury Crags, are we going to put a giant net all round the extinct volcano? Then again, I think anyone who was planning to jump off the Crags would probably be pretty serious about it and of course they wouldn’t have the big audience they’d get on the bridge (yeah, I know, cynical, but also probably true since such a public act usually is more of a cry for help – still makes you feel sorry for the guy that he was driven to it though). Since the traffic in the city was totally messed up by the bridge closure and diversions he caused for hours I looked at the jam of buses and gave up, buggered off to the pub with my friend who was just coming out of his work. Maybe a relaxing pint would have been better for this poor bloke too instead of standing around over a huge drop.